Most people have seen a picture of a fortune teller gazing into a crystal ball. The client anxiously awaits for his or her fortune to be unraveled. This practice, called crystal ball gazing (or scrying), allows the seer to get into a trance-like state to connect to universal or Divine energy. The seer may receive impressions or insight that is supposed to be meaningful to one’s life. Gazing is also done with water, mirrors, candles, or any other shiny object. What Might Crystal Gazers Be Seeing? Now, let’s consider the following possibility regarding crystal ball gazing, which might explain how some seers gather information. On an energetic level, crystals are powerful. For one, they refract and reflect light, which is a form of energy, like thoughts, ailments, emotions, etc (mentioned above). So in a session, the aforementioned energies are refracted and reflected. Since the crystal is shaped like a circle, the energy radiates in all directions. In the physical world, we can be affected by other people’s emotions, visually see things about them, observe their behavior, etc. But we don’t know what’s really going on unless they tell us. During a session, the medium is in a deep, meditative state; the pineal gland (or 3rd eye) could be “activated” or “the eyelid” is now open. This could possibly allow the seer to see things that exist outside the reality we experience with our 5 senses, like the dream world. The “eye” connects to the light or energy and may interpret it as symbols or images, etc. These things might relate to the client. It’s like the medium accessed a certain aspect of the person to see what’s going on with him or her, and the person didn’t have to audibly say anything. Opening this door, and being in this very vulnerable state, can open you up to something else that creeps on the earth, which is truth–not just a possibility. Many evil spirits roam the earth, and you will notice that some seers or psychics say that a spirit guide helps them, which may be living in them. Evil spirits can have an effect on the body, thoughts, & emotions (when God allows). These forces could even communicate that something will happen when you walk out the door and cause things to happen so that it seems they predicted the future, which is a trick. They could put images or symbols in your mind & provoke certain feelings. They could learn a lot about a person by getting into his or her mind and relaying that to the seer, and they could even imitate people you know; they are masters of deception and manipulation. How do I know? Because God allowed me to experience some of this power, though not in this way. Their power is nothing to play with–though always under God’s control. So it seems this practice might open some kind of gateway, but this is a door Christians should not open (Deuteronomy 18:9-12) (Acts 19:19) (Galatians 5:19-20). We are to meditate on God’s word, pray to Him for guidance, keep our minds stayed on Him, and look to him to help us on our journey. He speaks to us, reveals to us what he wants us to do, and guides us in all truth (John 16:13). You can also get Godly counsel from a Christian leader, friend, or counselor. But God is the final answer. We should not be going to a seer to tell us our future, gain insight about what we should do with our lives, bring wealth, romance, or ‘luck’ our way. This trance-like state is also kind of like being in a drunken or drug-induced state where your mind is clouded, which leaves you vulnerable to deception and confusion. You should not seek to forcibly alter your perception & open yourself up in this manner (or participate when someone else does it). The pineal gland does have an important natural function, as it produces melatonin, which helps maintain circadian rhythm and regulate reproductive hormones. And yes, there is some interesting Christian symbolism here that we can explore another time. So How Can We Use a Crystal Ball? Well, you can use a crystal ball to help balance the energy around you (& in you) to help with health (which could also boost mood). The sphere shape of the crystal is helpful because, as mentioned earlier, spheres radiate energy in all directions–instead of one generalized point, like a crystal point. You can leave one in your home, workspace, or office, & sometimes just hold it in your hands. But be sure to cleanse your ball every now and then, as they need care, just like you do. You can put the ball under a full moon, and the rays will gently cleanse and re-energize it. Natural Quartz Crystal. This ball will not look like the normal crystal balls that you are used to. It will have imperfections; you will see veins, which give it character. These balls are usually stronger & expensive. This is the preferred choice. Reconstituted Quartz. This is pure quartz that has been ground and heated. It is then reformed into a ball. It will not have veins and will look clear. This option is more affordable. Glass. This is just like the glass you buy at the store, which still contains quartz. These balls are not coveted because they lack the vibrational energy of the others. This is not the preferred choice. You can find many gemstones and crystals shaped like a sphere. 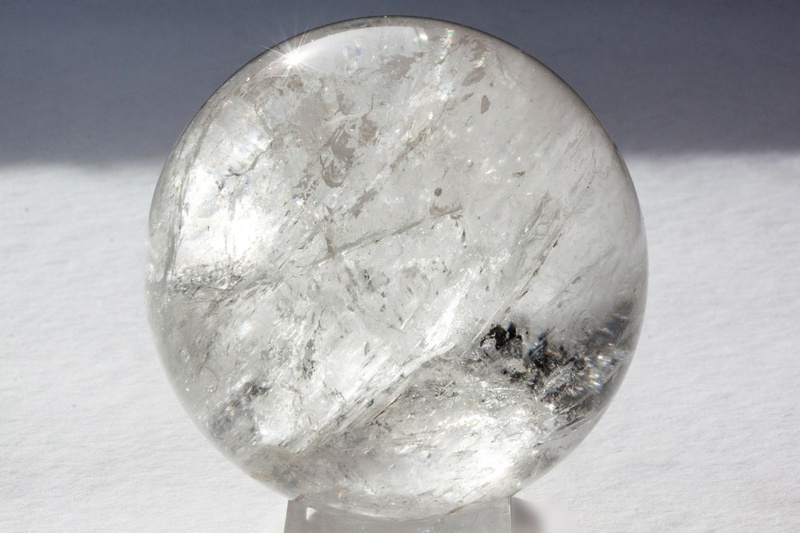 But clear quartz is helpful for all energy imbalances within the body (although there are a few more). Remember that all of creation was made Good (Genesis 1:31), but it can be used in the wrong or right way. Christians must allow God to guide them in all things, and we should always guard our hearts.